Proprietary Name: Ketorolac Tromethamine What is the Proprietary Name? Non-Proprietary Name: Ketorolac Tromethamine What is the Non-Proprietary Name? Ketorolac Tromethamine with NDC 70518-1889 is a a human prescription drug product labeled by Remedyrepack Inc.. The generic name of Ketorolac Tromethamine is ketorolac tromethamine. The product's dosage form is injection, solution and is administered via intramuscular; intravenous form. FDA Application Number: ANDA204216 What is the FDA Application Number? Ketorolac Tromethamine TabletsKetorolac tromethamine tablets are indicated only as continuation therapy to ketorolac tromethamine injection, and the combined duration of use of ketorolac tromethamine injection and ketorolac tromethamine tablets is not to exceed 5 (five) days, because of the increased risk of serious adverse events. Ketorolac tromethamine, a nonsteroidal anti-inflammatory drug (NSAID), is indicated for the short-term (up to 5 days in adults) management of moderately severe acute pain that requires analgesia at the opioid level. Oral ketorolac tromethamine is indicated only as continuation treatment following IV or IM dosing of ketorolac tromethamine, if necessary. The total combined duration of use of oral ketorolac tromethamine and ketorolac tromethamine injection should not exceed 5 days. WARNINGS). Ketorolac tromethamine is CONTRAINDICATED in patients with previously demonstrated hypersensitivity to ketorolac tromethamine or allergic manifestations to aspirin or other nonsteroidal anti-inflammatory drugs (NSAIDs). INTRATHECAL OR EPIDURAL ADMINISTRATIONKetorolac tromethamine is CONTRAINDICATED for intrathecal or epidural administration due to its alcohol content. RISK DURING LABOR AND DELIVERYThe use of ketorolac tromethamine in labor and delivery is CONTRAINDICATED because it may adversely affect fetal circulation and inhibit uterine contractions. CONCOMITANT USE WITH NSAIDsKetorolac tromethamine is CONTRAINDICATED in patients currently receiving aspirin or NSAIDs because of the cumulative risk of inducing serious NSAID-related side effects. WARNINGS). Doses of ketorolac tromethamine injection are not to exceed 60 mg (total dose per day) in these patients. 3Ketorolac tromethamine is a racemic mixture of [-]S and [+]R ketorolac tromethamine. Ketorolac tromethamine may exist in three crystal forms. All forms are equally soluble in water. Ketorolac tromethamine has a pKa of 3.5 and an n-octanol/water partition coefficient of 0.26. The molecular weight of ketorolac tromethamine is 376.40. 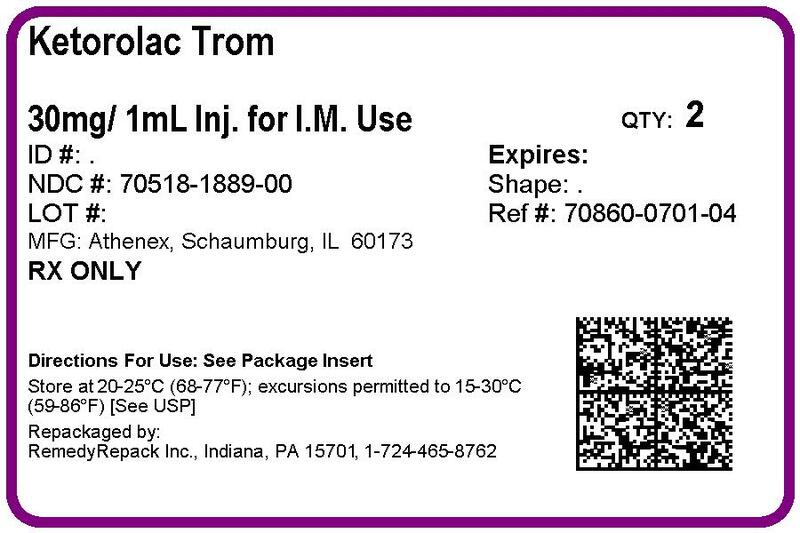 Ketorolac Tromethamine Injection, USP is available for intravenous (IV) or intramuscular (IM) administration as: 15 mg in 1 mL (1.5%) and 30 mg in 1 mL (3%) in sterile solution; 60 mg in 2 mL (3%) of ketorolac tromethamine in sterile solution is available for IM administration only. The solutions contain 10% (w/v) alcohol, USP, and 6.68 mg, 4.35 mg and 8.70 mg respectively, of sodium chloride in sterile water. The pH range is 6.9 to 7.9 and is adjusted with sodium hydroxide and/or hydrochloric acid. The sterile solutions are clear to slightly yellow in color. Ketorolac tromethamine is a nonsteroidal anti-inflammatory drug (NSAID) that exhibits analgesic activity in animal models. The mechanism of action of ketorolac, like that of other NSAIDs, is not completely understood but may be related to prostaglandin synthetase inhibition. The biological activity of ketorolac tromethamine is associated with the S-form. Ketorolac tromethamine possesses no sedative or anxiolytic properties. The peak analgesic effect of ketorolac tromethamine occurs within 2 to 3 hours and is not statistically significantly different over the recommended dosage range of ketorolac tromethamine. The greatest difference between large and small doses of ketorolac tromethamine by either route is in the duration of analgesia. Table 1. In adults, the extent of bioavailability following administration of the ORAL and IM forms of ketorolac tromethamine was equal to that following an IV bolus. In adults, following administration of single ORAL, IM or IV doses of ketorolac tromethamine in the recommended dosage ranges, the clearance of the racemate does not change. This implies that the pharmacokinetics of ketorolac tromethamine in adults, following single or multiple IM, IV or recommended oral doses of ketorolac tromethamine, are linear. At the higher recommended doses, there is a proportional increase in the concentrations of free and bound racemate. β) of ketorolac tromethamine following complete distribution was approximately 13 liters. This parameter was determined from single-dose data. The ketorolac tromethamine racemate has been shown to be highly protein bound (99%). Nevertheless, plasma concentrations as high as 10 mcg/mL will only occupy approximately 5% of the albumin binding sites. Thus, the unbound fraction for each enantiomer will be constant over the therapeutic range. A decrease in serum albumin, however, will result in increased free drug concentrations. CLINICAL PHARMACOLOGY, Kinetics in Special Populations). The half-life of the ketorolac tromethamine S-enantiomer was approximately 2.5 hours (SD±0.4) compared with 5 hours (SD±1.7) for the R-enantiomer. In other studies, the half-life for the racemate has been reported to lie within the range of 5 to 6 hours. max on Day 1 and Day 5. Trough levels averaged 0.29 mcg/mL (SD±0.13) on Day 1 and 0.55 mcg/mL (SD±0.23) on Day 6. Steady state was approached after the fourth dose. Table 1). There are no pharmacokinetic data available for administration of ketorolac tromethamine by the IM route in pediatric patients. Based on single-dose data only, the mean half-life of ketorolac tromethamine in renally impaired patients is between 6 and 19 hours, and is dependent on the extent of the impairment. There is poor correlation between creatinine clearance and total ketorolac tromethamine clearance in the elderly and populations with renal impairment (r=0.5). ∞ of each enantiomer increased by approximately 100% compared with healthy volunteers. The volume of distribution doubles for the S-enantiomer and increases by 1/5th for the R-enantiomer. The increase in volume of distribution of ketorolac tromethamine implies an increase in unbound fraction. Kinetics in Special Populations for use of IV dosing of ketorolac tromethamine in pediatric patients). In a postoperative study, where all patients received morphine by a PCA device, patients treated with ketorolac tromethamine IV as fixed intermittent boluses (e.g., 30 mg initial dose followed by 15 mg q3h), required significantly less morphine (26%) than the placebo group. Analgesia was significantly superior, at various postdosing pain assessment times, in the patients receiving ketorolac tromethamine IV plus PCA morphine as compared to patients receiving PCA-administered morphine alone. Ketorolac tromethamine is indicated for the short-term (≤5 days) management of moderately severe acute pain that requires analgesia at the opioid level, usually in a postoperative setting. Therapy should always be initiated with IV or IM dosing of ketorolac tromethamine, and oral ketorolac tromethamine is to be used only as continuation treatment, if necessary. WARNINGS for correction of volume depletion). Ketorolac tromethamine is contraindicated in labor and delivery because, through its prostaglandin synthesis inhibitory effect, it may adversely affect fetal circulation and inhibit uterine musculature, thus increasing the risk of uterine hemorrhage. Ketorolac tromethamine injection is contraindicated for neuraxial (epidural or intrathecal) administration due to its alcohol content. The total combined duration of use of oral ketorolac tromethamine and IV or IM dosing of ketorolac tromethamine is not to exceed 5 days in adults. Ketorolac tromethamine is not indicated for use in pediatric patients. Gastrointestinal Effects - Risk of Ulceration, Bleeding, and Perforation: Ketorolac tromethamine is contraindicated in patients with previously documented peptic ulcers and/or gastrointestinal (GI) bleeding. Ketorolac tromethamine can cause serious gastrointestinal (GI) adverse events including bleeding, ulceration and perforation, of the stomach, small intestine, or large intestine, which can be fatal. These serious adverse events can occur at any time, with or without warning symptoms, in patients treated with ketorolac tromethamine. Only one in five patients who develop a serious upper GI adverse event on NSAID therapy is symptomatic. Minor upper gastrointestinal problems, such as dyspepsia, are common and may also occur at any time during NSAID therapy. The incidence and severity of gastrointestinal complications increases with increasing dose of, and duration of treatment with ketorolac tromethamine. Do not use ketorolac tromethamine for more than five days. However, even short-term therapy is not without risk. In addition to past history of ulcer disease, other factors that increase the risk for GI bleeding in patients treated with NSAIDs include concomitant use of oral corticosteroids, or anticoagulants, longer duration of NSAID therapy, smoking, use of alcohol, older age, and poor general health status. Most spontaneous reports of fatal GI events are in elderly or debilitated patients and therefore, special care should be taken in treating this population. Because prostaglandins play an important role in hemostasis and NSAIDs affect platelet aggregation as well, use of ketorolac tromethamine in patients who have coagulation disorders should be undertaken very cautiously, and those patients should be carefully monitored. Patients on therapeutic doses of anticoagulants (e.g., heparin or dicumarol derivatives) have an increased risk of bleeding complications if given ketorolac tromethamine concurrently; therefore, physicians should administer such concomitant therapy only extremely cautiously. The concurrent use of ketorolac tromethamine and therapy that affects hemostasis, including prophylactic low-dose heparin (2,500 to 5,000 units q12h), warfarin and dextrans have not been studied extensively, but may also be associated with an increased risk of bleeding. Until data from such studies are available, physicians should carefully weigh the benefits against the risks, and use such concomitant therapy in these patients only extremely cautiously. Patients receiving therapy that affects hemostasis should be monitored closely. DOSAGE AND ADMINISTRATION) and such patients should be followed closely. With the use of ketorolac tromethamine, there have been reports of acute renal failure, interstitial nephritis and nephrotic syndrome. CONTRAINDICATIONS). Ketorolac tromethamine should be used with caution in patients with impaired renal function or a history of kidney disease because it is a potent inhibitor of prostaglandin synthesis. Because patients with underlying renal insufficiency are at increased risk of developing acute renal decompensation or failure, the risks and benefits should be assessed prior to giving ketorolac tromethamine to these patients. PRECAUTIONS, Pre-existing Asthma). Emergency help should be sought in cases where an anaphylactoid reaction occurs. Observational studies conducted in the Danish National Registry have demonstrated that patients treated with NSAIDs in the post-MI period were at increased risk of reinfarction, CV-related death, and all-cause mortality beginning in the first week of treatment. In this same cohort, the incidence of death in the first year post MI was 20 per 100 person years in NSAID-treated patients compared to 12 per 100 person years in non-NSAID exposed patients. Although the absolute rate of death declined somewhat after the first year post-MI, the increased relative risk of death in NSAID users persisted over at least the next four years of follow-up. Avoid the use of Ketorolac Tromethamine Injection, USP in patients with a recent MI unless the benefits are expected to outweigh the risk of recurrent CV thrombotic events. If Ketorolac Tromethamine Injection, USP is used in patients with a recent MI, monitor patients for signs of cardiac ischemia. NSAIDs, including ketorolac tromethamine, can lead to onset of new hypertension or worsening of pre-existing hypertension, either of which may contribute to the increased incidence of CV events. Patients taking thiazides or loop diuretics may have impaired response to these therapies when taking NSAIDs. NSAIDs, including ketorolac tromethamine, should be used with caution in patients with hypertension. Blood pressure (BP) should be monitored closely during the initiation of NSAID treatment and throughout the course of therapy. Avoid the use of Ketorolac Tromethamine Injection, USP in patients with severe heart failure unless the benefits are expected to outweigh the risk of worsening heart failure. If Ketorolac Tromethamine Injection, USP is used in patients with severe heart failure, monitor patients for signs of worsening heart failure. NSAIDs, including ketorolac tromethamine, can cause serious skin adverse events such as exfoliative dermatitis, Stevens-Johnson Syndrome (SJS), and toxic epidermal necrolysis (TEN), which can be fatal. These serious events may occur without warning. Patients should be informed about the signs and symptoms of serious skin manifestations and use of the drug should be discontinued at the first appearance of skin rash or any other sign of hypersensitivity. Patients with asthma may have aspirin-sensitive asthma. The use of aspirin in patients with aspirin-sensitive asthma has been associated with severe bronchospasm which can be fatal. Since cross reactivity, including bronchospasm, between aspirin and other nonsteroidal anti-inflammatory drugs has been reported in such aspirin-sensitive patients, ketorolac tromethamine should not be administered to patients with this form of aspirin sensitivity and should be used with caution in patients with pre-existing asthma. ADVERSE REACTIONS sections), instruct patients to seek medical advice if they develop treatment-related adverse events, and advise patients not to give oral ketorolac tromethamine to other family members and to discard any unused drug. Remember that the total combined duration of use of oral ketorolac tromethamine and IV or IM dosing of ketorolac tromethamine is not to exceed 5 days in adults. Ketorolac tromethamine is not indicated for use in pediatric patients. Patients should be informed of the following information before initiating therapy with an NSAID and periodically during the course of ongoing therapy. Patients should also be encouraged to read the NSAID Medication Guide that accompanies each prescription dispensed. WARNINGS, Gastrointestinal Effects - Risk of Ulceration, Bleeding, and Perforation). Because serious GI tract ulcerations and bleeding can occur without warning symptoms, physicians should monitor for signs or symptoms of GI bleeding. Patients on long-term treatment with NSAIDs, should have their CBC and a chemistry profile checked periodically. If clinical signs and symptoms consistent with liver or renal disease develop, systemic manifestations occur (e.g., eosinophilia, rash etc.) or if abnormal liver tests persist or worsen, ketorolac tromethamine should be discontinued. tolbutamide did not alter ketorolac tromethamine protein binding. WARNINGS, Renal Effects), as well as to assure diuretic efficacy. probenecid resulted in decreased clearance and volume of distribution of ketorolac and significant increases in ketorolac plasma levels (total AUC increased approximately threefold from 5.4 to 17.8 mcg/h/mL) and terminal half-life increased approximately twofold from 6.6 to 15.1 hours. Therefore, concomitant use of ketorolac tromethamine and probenecid is contraindicated. ACE inhibitors and/or angiotensin II receptor antagonists may increase the risk of renal impairment, particularly in volume-depleted patients. psychoactive drugs (fluoxetine, thiothixene, alprazolam). pentoxifylline, there is an increased tendency to bleeding. nondepolarizing muscle relaxants that resulted in apnea. The concurrent use of ketorolac tromethamine with muscle relaxants has not been formally studied. selective serotonin reuptake inhibitors (SSRIs) are combined with NSAIDs. Caution should be used when NSAIDs are administered concomitantly with SSRIs. An 18-month study in mice with oral doses of ketorolac tromethamine tablets at 2 mg/kg/day (0.9 times the human systemic exposure at the recommended IM or IV dose of 30 mg qid, based on area-under-the-plasma-concentration curve [AUC]), and a 24-month study in rats at 5 mg/kg/day (0.5 times the human AUC) showed no evidence of tumorigenicity. in vivo mouse micronucleus assay. At 1,590 mcg/mL and at higher concentrations, ketorolac tromethamine increased the incidence of chromosomal aberrations in Chinese hamster ovarian cells. Reproduction studies have been performed during organogenesis using daily oral doses of ketorolac tromethamine tablets at 3.6 mg/kg (0.37 times the human AUC) in rabbits and at 10 mg/kg (1.0 times the human AUC) in rats. Results of these studies did not reveal evidence of teratogenicity to the fetus. However, animal reproduction studies are not always predictive of human response. Because of the known effects of nonsteroidal anti-inflammatory drugs on the fetal cardiovascular system (closure of ductus arteriosus), use during pregnancy (particularly late pregnancy) should be avoided. Oral doses of ketorolac tromethamine tablets at 1.5 mg/kg (0.14 times the human AUC), administered after gestation day 17, caused dystocia and higher pup mortality in rats. The use of ketorolac tromethamine, as with any drug known to inhibit cyclooxygenase/ prostaglandin synthesis, may impair fertility and is not recommended in women attempting to conceive. In women who have difficulty conceiving or are undergoing investigation of infertility, withdrawal of ketorolac tromethamine should be considered. Limited data from one published study that included 10 breastfeeding women 2-6 days postpartum showed low levels of ketorolac in breast milk and were undetectable (less than 5 ng/mL) in 4 of the patients. After a single administration of 10 mg of ketorolac tromethamine, the maximum milk concentration observed was 7.3 ng/mL, and the maximum milk-to-plasma ratio was 0.037. After 1 day of dosing (10 mg every 6 hours), the maximum milk concentration was 7.9 ng/mL, and the maximum milk-to-plasma ratio was 0.025. Assuming a daily intake of 400 to 1,000 mL of human milk per day and a maternal body weight of 60 kg, the calculated maximum daily infant exposure was 0.00263 mg/kg/day, which is 0.4% of the maternal weight-adjusted dose. Exercise caution when ketorolac is administered to a nursing woman. Available information has not shown any specific adverse events in nursing infants; however, instruct patients to contact their infant's healthcare provider if they note any adverse events. Ketorolac tromethamine is not indicated for use in pediatric patients. The safety and effectiveness of ketorolac tromethamine in pediatric patients below the age of 17 have not been established. DOSAGE AND ADMINISTRATION) and careful clinical monitoring must be used when treating the elderly with ketorolac tromethamine. DOSAGE AND ADMINISTRATION). These NSAID-related complications can be serious in certain patients for whom ketorolac tromethamine is indicated, especially when the drug is used inappropriately. as an initial dose.Use minimum effective dose for the individual patient. Total duration of treatment in adult patients: the combined duration of use of IV or IM dosing of ketorolac tromethamine and oral ketorolac tromethamine is not to exceed 5 days. WARNINGS, Renal Effects). Patients should be switched to alternative analgesics as soon as possible, but ketorolac tromethamine therapy is not to exceed 5 days. When administering ketorolac tromethamine injection, the IV bolus must be given over no less than 15 seconds. The IM administration should be given slowly and deeply into the muscle. The analgesic effect begins in ~30 minutes with maximum effect in 1 to 2 hours after dosing IV or IM. Duration of analgesic effect is usually 4 to 6 hours. Single-Dose Treatment: The following regimen should be limited to single administration use onlyIM DosingPatients <65 years of age: One dose of 60 mg. Patients ≥65 years of age, renally impaired and/or less than 50 kg (110 lbs) of body weight: One dose of 30 mg.
IV DosingPatients <65 years of age: One dose of 30 mg. Patients ≥65 years of age, renally impaired and/or less than 50 kg (110 lbs) of body weight: One dose of 15 mg.
Multiple-Dose Treatment (IV or IM)Patients <65 years of age: The recommended dose is 30 mg ketorolac tromethamine injection every 6 hours. The maximum daily dose for these populations should not exceed 120 mg. WARNINGS), and patients less than 50 kg (110 lbs): The recommended dose is 15 mg ketorolac tromethamine injection every 6 hours. The maximum daily dose for these populations should not exceed 60 mg.
For breakthrough pain, do not increase the dose or the frequency of ketorolac tromethamine. Consideration should be given to supplementing these regimens with low doses of opioids “prn” unless otherwise contraindicated. Ketorolac tromethamine injection should not be mixed in a small volume (e.g., in a syringe) with morphine sulfate, meperidine hydrochloride, promethazine hydrochloride or hydroxyzine hydrochloride; this will result in precipitation of ketorolac from solution. Store at 20° to 25°C (68° to 77°F). [See USP Controlled Room Temperature. ]Protect from light. Retain in carton until time of use. Who should not take NSAIDs?Do not take NSAIDs:if you have had an asthma attack, hives, or other allergic reaction with aspirin or any other NSAIDs. Are pregnant or plan to become pregnant. Talk to your healthcare provider if you are considering taking NSAIDs during pregnancy. You should not take NSAIDs after 29 weeks of pregnancy.are breastfeeding or plan to breast feed. Tell your healthcare provider about all of the medicines you take, including prescription or over-the-counter medicines, vitamins or herbal supplements. NSAIDs and some other medicines can interact with each other and cause serious side effects. If you take too much of your NSAID, call your healthcare provider or get medical help right away.These are not all the possible side effects of NSAIDs. For more information, ask your healthcare provider or pharmacist about NSAIDs. General information about the safe and effective use of NSAIDsMedicines are sometimes prescribed for purposes other than those listed in a Medication Guide. Do not use NSAIDs for a condition for which it was not prescribed. Do not give NSAIDs to other people, even if they have the same symptoms that you have. It may harm them.